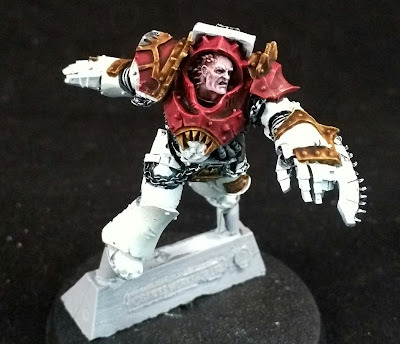 So as I mentioned, I am putting together two squads of Red Butchers, one in the pre-Heresy White and blue regalia and a second squad in the Heresy Red and White armor. 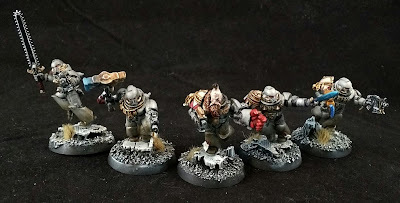 Here is a WIP of the progress on the second squad. Behold the red and white armor of these noble psychopaths!! A shot of the red and brass sections before I started shading and doing preliminary highlights. And I still have many more to complete before the unit is table top ready. 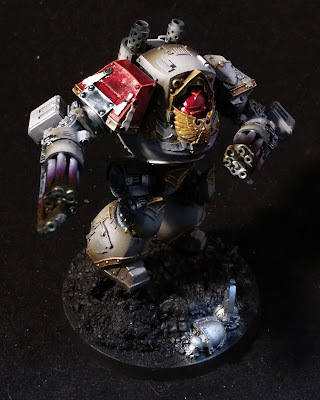 Given I was knocking over two birds with one stone, I thought I would throw my casual World Eaters Leviathan into the mix, too. Now that the shoulders are out of the way and the rest of the fellow is primed and ready to go, I guess I should spray the rest of this "little dude" up. 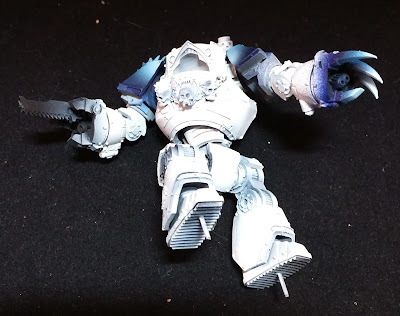 As I mentioned, I had the airbrush out, so I could do some World Eater Shoulder pad and Close combat claw transitions. Now bear in mind, I am still laying down the base colors, so the whites are a little too white and the blue may need to be muted with a glaze wash, or two. Some progress on the Assault Marines. 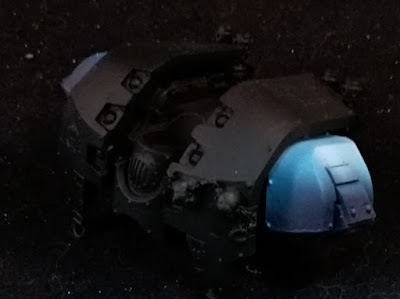 I had the airbrush out while I was doing some transitions on the shoulder pads of my World Eaters force, so i thought I would quickly bang out the close combat weapons for my Space Wolves Assault squad. Here are some progress shots. First up the transition work on the close combat weapon. And the basic layout for the jump pack. More to come on this, as I am prioritizing finishing this unit so I can concentrate on the World Eaters. So back to the prize. It took me a few weeks to get back around to finishing my portion of the prize. You see, neither of us could find a aesthetically suitable head for this miniature. 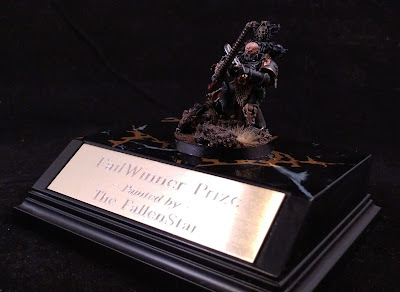 Well that was the case until the Deathwatch Kill Team was released. 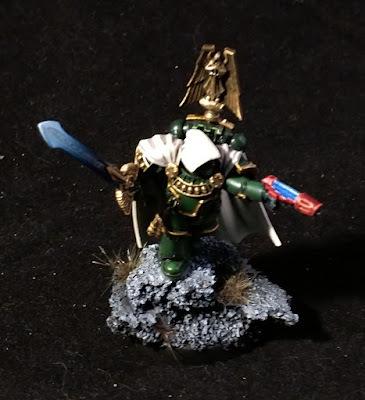 In that release there was a certain Space Wolves Veteran head that just captured what both of us had pictured in our minds. 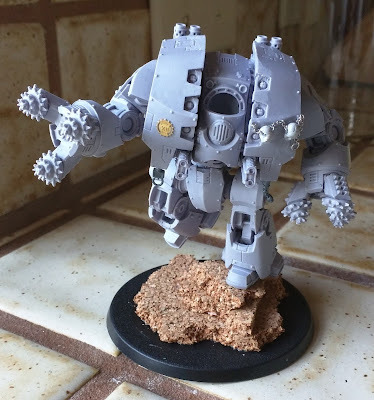 So after a coat of paint I added this to the "headless" miniature. General Ramblings - Hippy Barf-day!! Happy One Year Birthday / Anniversary for Sprue Whispering! So I thought I would do something a little different and a little special for the One Year Birthday / Anniversary of the blog. Current number of Posts:365 - Yay! Number of Projects Started: 42 - The meaning of Life ... Number of Projects Completed:21 - Sad Panda, only 50% completed. 100% started, though .. does that count? 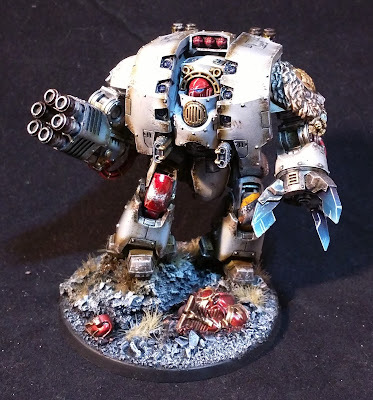 All time page views:15,005 (as of writing this post)Top 3 Most viewed postsTutorial - World Eaters Contemptor Dreadnought Part #2 - LegsArjac Rockfist kit-bash #4Space Wolf Dreadnought kit-bash #12Largest Audience by Country:USA has the largest conglomeration of viewers, followed by Germany. So enough with the statistics. So what are some of the projects? It all starts with a thought, a twinkling of an idea late at night. And, a few weeks later something arrives at your doorstep. And look what happens ... A casual Leviathan!! But this little fellow screams, "Blood for the Blood God!". First I had to work out and get the posing correct. Then I added some minor details. A Brass etch XII Legion symbol and the usual chain and skulls detailing. Time to give this one a bath and lay down some primer and paint. Did somebody say, "Cyclonic Melta Lance" ? Well here's one, coming right on up! All painted and weathered and now ready to see some action. I just need to add some decals (water slide transfers) to finish the whole miniature. Here's a blast from the past. I found this guy, sitting about and actually attached him to a base. 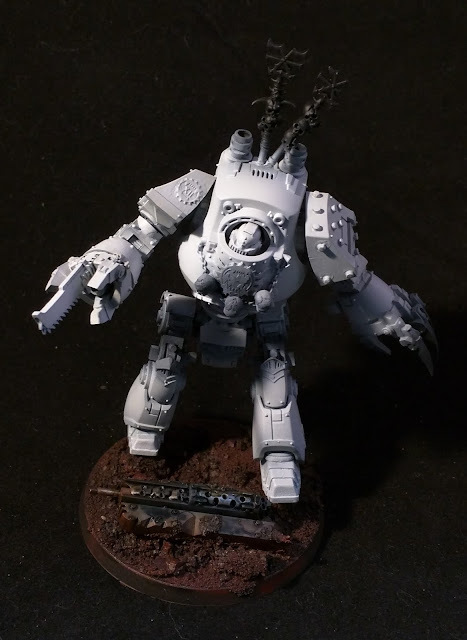 I should go back in and finish some weathering, edge highlighting and grab a proper picture of the little fella. I started knocking back the extremity of some of my pre-weathering. I have to go in and start finishing off the detail work. Colors are down and I am starting to build the scheme. I still have to go back and start building the shading in the recesses. This time I will use the handy tutorial from Lil'Legends Studios, found here. I will post up my progress as I follow the tutorial.